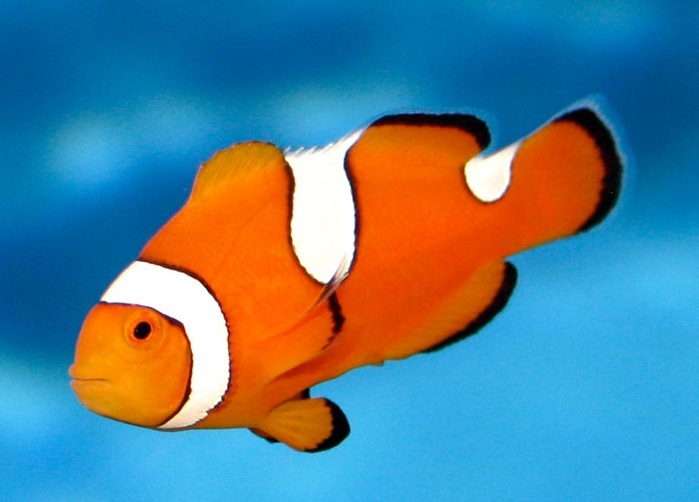 Designer clownfishes have become very popular in the saltwater aquarium hobby, and misbar clownfishes are the least controversial of these aquacultured fishes. Clownfishes are one of the most popular fishes in the marine aquarium hobby, and they are frequently available as tank-raised individuals. While it is possible to purchase familiar clownfishes like the false percula or ocellaris clownfish (Amphiprion ocellaris), the true percula clownfish (Amphiprion percula) and the maroon clownfish (Premnas biaculeatus) as tank-raised fishes, a niche market has emerged for aquacultered clownfishes with abnormal traits. 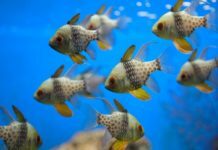 These clownfishes include the popular Picasso clownfish, the naked clownfish, and, the subject of this article, the misbar clownfish. 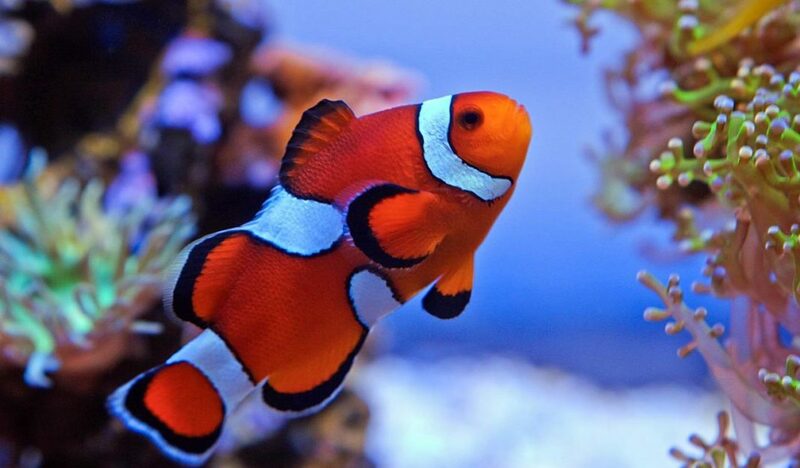 Generally speaking, these fishes are known as “designer clownfishes”. Misbar clownfishes are not a new or separate species of clownfish, instead they are simply barred clownfishes, like the false percula clownfish, with a unique color morph. They are called misbars because the white bars common to these clownfish species are incomplete. This misbarring is viewed as aesthetically pleasing by some, and so a misbar false percula clownfish tends to fetch a higher price than a “normal” false percula clownfish. 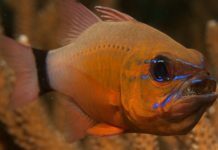 This higher price has caused some commercial fish breeders to attempt to selectively breed for the misbar color morph. 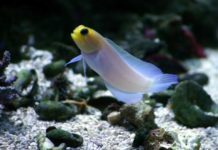 There is debate amongst aquarists about the ethics behind selectively breeding fishes with the intent of cultivating an abnormality. The debate heats up when more aggressive selective breeding techniques are employed such as chemically treating a fish’s eggs, forcing unrelated species to cross breed, or manipulating the water parameters for a desired effect. 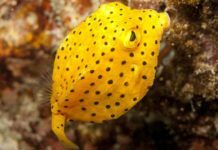 The results of such selective breeding are often fishes that look nothing like their wild ancestors, and it is unlikely that these selectively bred fishes would survive if released into the wild. Not all abnormalities are cultivated, and many are commonly culled by breeders. These include deformed mouths, deformed gill plates, missing fins, missing eyes, and many others. Some abnormalities, however, are considered aesthetically desirable by hobbyists, and hence fishes with these abnormalities are generally not culled. In addition to misbars, fishes with absent vertebra (known in the hobby as “stubbies”) are also commonly not culled. 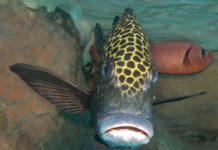 In the case of the misbar clownfishes, there is not much serious ethical debate. 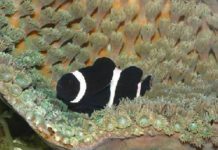 Most people seem to agree that there is a place for misbar clownfishes in the hobby, especially since the misbarring happens in the wild without any aggressive selective breeding techniques. 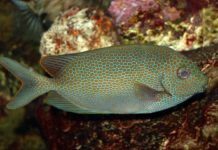 It’s interesting to note that while misbarring can certainly be the result of manipulating the fish’s environmental conditions, it is also possible that it is genetic. Nonetheless, there are those who believe that aggressive culling is the only appropriate choice when captive breeding results in any inferior abnormality. An “inferior abnormality” may be defined as any difference from the species’ natural form. Consequently for some, even misbar clownfishes have no place in the hobby. 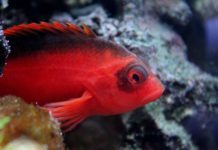 Just like any other issue in the marine aquarium hobby, the educated hobbyist is the better hobbyist. Moving forward, hobbyists will need to use their knowledge and personal philosophies to inform their purchasing decisions. 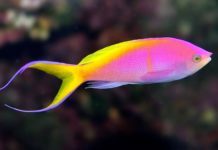 In regards to designer fishes and aquaculture, the purchasing power of the individual hobbyist can and will shape the role that captive breeding plays in the future of the hobby.